One of the valuable possessions of the authentic and original TLCC is the Signatory Liturgy. 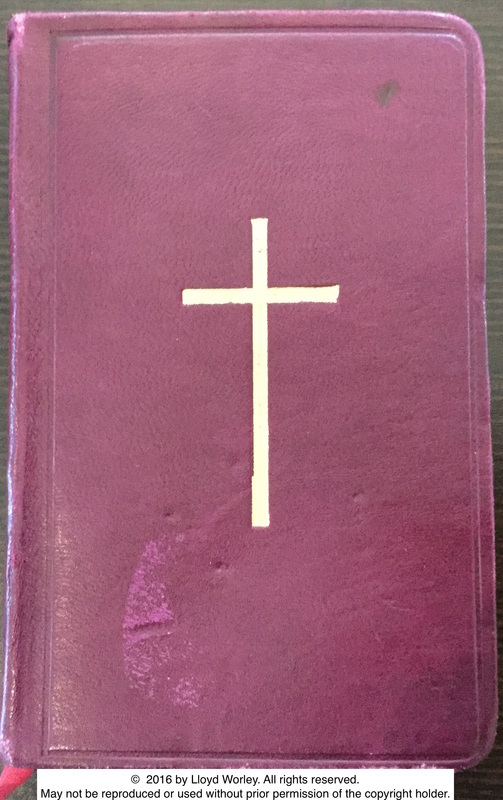 This artifact is a signed and annotated first edition of The Liturgy of The Liberal Catholic Church which bears the autographs of the Founding Bishops of The LCC, along with commentary from Founding Consecrator the Rt. Rev. F.S. Willoughby. This is the cover of the signed and annotated first edition of The Liturgy of The Liberal Catholic Church. The significance of the existence of this Signatory Liturgy will be discussed, below. ​This Signatory Liturgy was brought by Presiding Bishop Graham Wale to the Centennial of The Liberal Catholic Church and displayed and examined by the Bishops present. Consecration of The Rt. Rev. James Ingall Wedgwood, London, 13 February 1916. Left to right: Rt. Rev. Robert King, Assistant Consecrator; Rt. Rev. James Ingall Wedgwood; Rt. Rev. Frederick Samuel Willoughby, M.A., Consecrator; Rt. Rev. Rupert Gauntlett, Assistant Consecrator; The Very.Rev. J. B. Seaton, Provost. On the flyleaf of the first edition of The LCC Liturgy, below, you will see the signatures of these Bishops. On the flyleaf page above is written a dedication of this first edition to Bishop F.S. Willoughby. This little work is dedicated. [note: the English phrase "is dedicated" is implied by the Latin structure]. See fly-leaf at end. J.I.W. + Dr. F.S. Willoughby, epis. This Liturgy is the result of much hard work by Bps. Wedgwood and Leadbeater who realized that the Old Catholic Liturgy was no longer suited for the work of The Liberal Catholic Church. This First Edition has remained almost unchanged to this day. This Signatory Liturgy shows that the consecrators of Bishop Wedgwood (Willoughby, Gauntlet, and King) didn't simply disappear after the Wedgwood Consecration, but were fully aware of and approving of the ongoing work of The LCC. 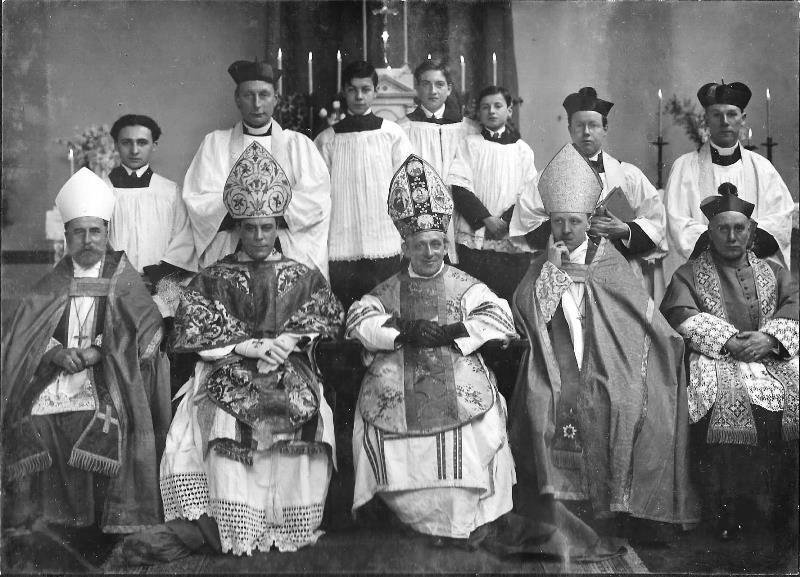 The three Bishops endorsed, encouraged, and helped The Liberal Catholic Church in its early days under the direction of Bp. Wedgwood. Their ongoing friendship and support of Bp. Wedgwood and Bp. Leadbeater are demonstrated by the existence of this Signatory Liturgy. The notation by Bp. Willoughby on the back fly-leaf shows his continued support of The Liberal Catholic Church, especially in that he desired that the Signatory Liturgy would be in the possession of the Presiding Bishop of the authentic and original TLCC. This wish has been carried out to this day. The Signatory Liturgy is currently held in trust for the authentic and original TLCC by its current Presiding Bishop, the Rt. Rev. Graham Wale. The photographs of the cover and pages of the Liturgy, above, are © 2016 by Lloyd Worley. All rights reserved. These photographs may not be reproduced or used in any manner without prior written permission of Lloyd Worley.